This September I want to meet Victor Cooke in Barbados. He clearly has studied his ecosystem and honed a hands-on immersion and narrative about the island. Victor can be a key collaborator in shaping a "Fully Accessible Barbados." We will all benefit to the expent thatresources like Fieldfare and the National Trails Accessibility Center in the US partner with his organization, Eco-Adventures Barbados, and Barbadian government agencies. Fieldfare works with people with disabilities and countryside managers to improve access to the countryside for everyone. For countryside service providers we provide advice and training services, supported by our research into national standards for accessibility under the BT Countryside for All Project. Fieldfare have recently created a new website www.phototrails.org.- Phototrails is an innovative concept that allows users to view countryside routes through a series of photographs and descriptions of the path features, taking in surface, path width, gradients, barriers and amenities such as seats, disabled parking, and accessible toilets, all of which, to some, is important information to know before making the decision on whether to visit a site or not. Some of the trails, and trips, and experiences waiting in Barbados will remain the province of Erik Weihenmayer and his strolls up Mt Everest with his white cane or Paralympian Kurt Fearnly crawling the Kokoda Track. Still there must be some "Stop 'n Stare" routes on the Rock that I can manage. The ultimate goal is to provide trail access for all to nature's wonders while protecting the environment through which these new trails pass. Makeover Suggestion 3: Is There a Place for Hippo Therapy in Barbados? 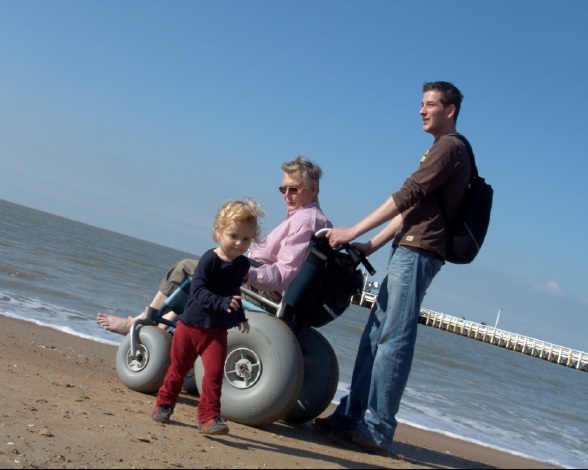 "Disabled riders often experience independence for the first time in their lives"
The partnership between humans and animals dates back to the first domestication of animals in the Stone Age, as long as 9,000 years ago. It is a known fact that animals, whether service animals, therapy animals or household pets, offer a multitude of benefits to human beings . 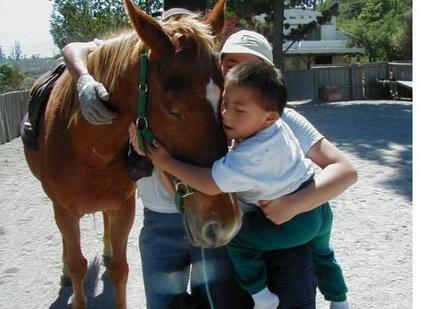 From providing a lonely person with love and companionship to the amazing benefits of Hippo Therapy (Equine Assisted Therapy) , there is no doubt that animals help improve the quality of life for millions of people with physical and mental disabilities. The Amor y Energia (AM-EN) (Love and Energy) Foundation is a well established, hippo therapy centre in Quito, Ecuador. 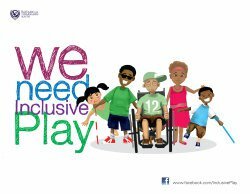 It is an independent, non-profit charitable organization committed to the social development of disabled children and young people. Based in Quito, Ecuador, AM-EN was founded in 1995 by Heidi Paliz from Germany. The United Nation Voluntary Fund for Disability sponsored the centre from 1999 until 2005. Their mandate was as a training project at a national level in Ecuador and sub regional level in Central America as well as Colombia, Peru, Bolivia and Brazil. Since its establishment, the Foundation has worked in the area of the rehabilitation of people with disabilities through riding therapy and other conventional and alternative therapies. Children, whose physicians had stated they would never be able to speak or walk, have, after some time at the Foundation, started to take their first steps and pronounce their first words and other children, previously rejected by educational establishments, have managed to begin their schooling. The Foundation also rescues horses which are often badly treated in South America. Many of the older horses can earn their living through working with children with disabilities which in turn is therapeutic for those horses which have been abused. Most of the people who receive therapy in Ecuador cannot afford to pay for the sessions. AM-EN relies almost exclusively on international grants and donations and the hard work of international volunteers. AM-EN Foundation now works with Huasquila Amazon Lodge which has wheelchair accessible bungalows, Hacienda Primavera Wilderness Ecolodge, San Jorge Eco Lodges and Ecuador For All (Tours for persons with disabilities). All have seen the opportunities and benefits of collaborating to provide the best possible service and expertise while at the same time contributing to the local economy by attracting more tourists to Ecuador and raising awareness of hippo therapy, accessibility and inclusion. Following Ecuador's example, how would Barbabos benefit? With its lush scenery and warm climate, Barbados could no doubt, provide a "ready-made" therapeutic setting for a hippo therapy program and possibly establish a partnership with the Barbados Equestrian Association. Already a popular and well-known tourist destination, Barbados could potentially work hand-in-hand with accessible travel specialists as well as the mainstream travel professionals. As the AM-EN Foundation has done in Ecuador, a hippo therapy program could also join forces with established accessible properties and accessible attractions in Barbados such as the Amaryllis Beach Resort, Harrison's Cave and Brown Sugar Restaurant. Establishing a centre in Barbados could attract horse trainers, clinical specialists, therapists, volunteers and supporting staff globally and could be considered for membership of NARHA (North American Riding for the Handicap Association). NARHA has nearly 800 member centers and over 6,300 individual members in countries all over the world. With this in mind, Barbados could definitely make an excellent host for national conventions, offering international attendees additional package combinations of attractions and hospitality to enhance their stay before and/ or after their convention on the island. persons with disabilities living within its' midst, some of whom could well use this service. As with the Am-EN Foundation, funding could come from international funds and donations. However, unlike Ecuador where there are over 1.6 million people with disabilities, most of whom cannot afford to pay for their "therapy" sessions, Barbados could no doubt, fare better in establishing a centre due to the fact that it has a moderately higher standard of living. Riding lessons could also be one way of offsetting the costs of the centre. As well, all Barbadian citizens are covered by national healthcare and could possibly have their "therapy" covered for by medical insurance. Thanks to pioneer Florencio Suarez Morciglio, neighbouring Puerto Rico is about to be the first Caribbean Island to offer a hippo therapy program Mr. Morciglio is a horse trainer and rider instructor in training and has been a NARHA member for the past 5 (five) years. He is presently in negotiations with the U.S.Government and NARHA regarding the setting up of a centre in Puerto Rico and would be an excellent resource. Clearly, establishing a hippo riding program in Barbados could open up a world of opportunities . Major benefits could include improved physical and mental health for Barbadians, an increase in tourism, a boost to the economy and bringing a new awareness of accessibility and inclusion. These factors could all contribute to this Caribbean island being well on its way to paving a friendlier path for persons with disabilities and to becoming a "Fully Accessible Barbados".